No. I am not talking about skittles. I am talking pretty rainbow cupcakes. Ever since I first saw the rainbow cake that Martha Stewart demo’d on her show a few years ago I wanted to make a rainbow cake. But the thought of dealing with all those layers in the cake kept me from even attempting it. 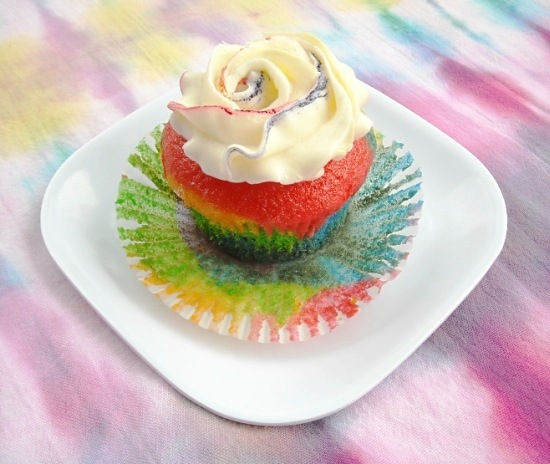 In the past year or so rainbow desserts have been popping up on many food blogs. When I saw the cupcakes I knew I was going to make them. Cupcakes are so much easier to handle then a mega layered cake. You may have read my chocolate candy cupcake picks post a few weeks ago and be thinking WHAT? I made those chocolate picks to decorate the cupcakes I planned to make for my grand daughters 5th birthday party. Well…. 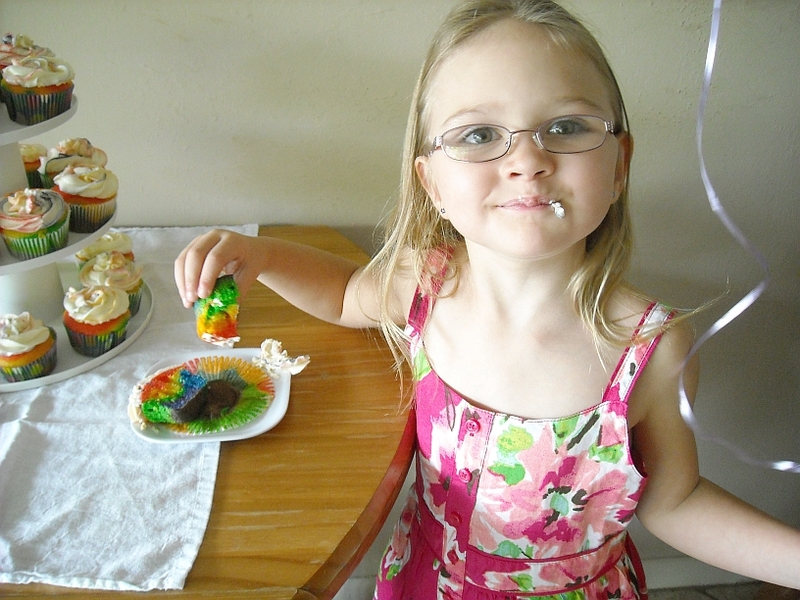 I changed my mind the day before the birthday party and decided to make the rainbow cupcakes instead. The chocolate candy picks are tucked away in the refrigerator and will be used another day. a trio of rainbow cupcakes from my grand daughters Rainbow themes birthday party. 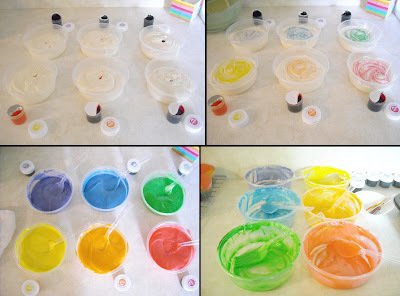 All boxed cake mixes are not created equally!I learned a few things on this multi colored adventure and thought I would pass along the tips just in case you find yourself about to embark on a very colorful day of cupcake making yourself. There really isn’t a recipe for this. It’s more of a technique. I used a boxed cake mix but you could do homemade yourself. Actually I ended up using two different brands of boxed white cake mix and this is where I learned a few things. If you going to be using a homemade cake recipe just remember you will need to use clear vanilla extract or you will not get a white cake. Also your recipe should use only egg whites not whole eggs because again the yolk will color the batter. I did make homemade frosting. My all time favorite frosting recipe is for Butter Cream Meringue. It is the best frosting you will ever taste! I found out the hard way that the brand of boxed cake mix you decide to use may turn out to be very important when planning the number of cupcakes you will need. Now if you are just making cupcakes for the fun of it then this won’t be an issue. Since we were also having cake I only planned on making the expected 24 cupcakes that you usually get out of one box of cake mix. Turns out the cake mix with pudding in it does not give you the standard 24 cupcakes. After mixing the cake mix per directions I noticed it was very thick. At that moment I didn’t think anything of it but when I started filling the cupcake papers I realized I was only going to get about 12 cupcakes. Luckily I had bought a couple of extra boxes of cake mix just in case something like this happened. The other mix I had bought did not have pudding in the mix. After everything was said and done I ended up with about 36 cupcakes. 12 from the pudding in the mix box and 24 from the cake mix with out the pudding in the mix. So if your planning for a crowd be sure you get a cake mix without the pudding in the mix. Another issue I had with the pudding in the mix cake is that when you over mix a cake batter when it cooks you run the risk of tunnels forming. It’s from all of the air bubbles that get stirred into the thick batter. It doesn’t affect the taste and as you can see the colors are beautiful and vibrant but that is not a very pretty picture of a cupcake is it? So my suggestion is if you have to use a pudding in the batter cake mix only mix it until all the dry ingredients are moistened and the lumps beat out. Most cake recipes call for you to mix until moistened and then to beat on high for two minutes. Cutting out the 2 minutes of mixing may help with this problem. Divide it between the bowls you plan to color the batter in. Stirring the food coloring in takes a bit of mixing and will replace those 2 minutes. The cupcakes were a hit. Everyone loved them and just taking a bite of the beautifully colored cupcake put a smile on everyone’s face. These are so cute, overmixed or not. I mean, they look delicious and adorable. Who cares about the little things? 😀 I am going now to check out that frosting recipe too. Thanks for sharing! I love what you did with the tops! So pretty! I love this, super great for kids and special occasions! How fun! I've always wondered how you get cupcake batter to be rainbowed. 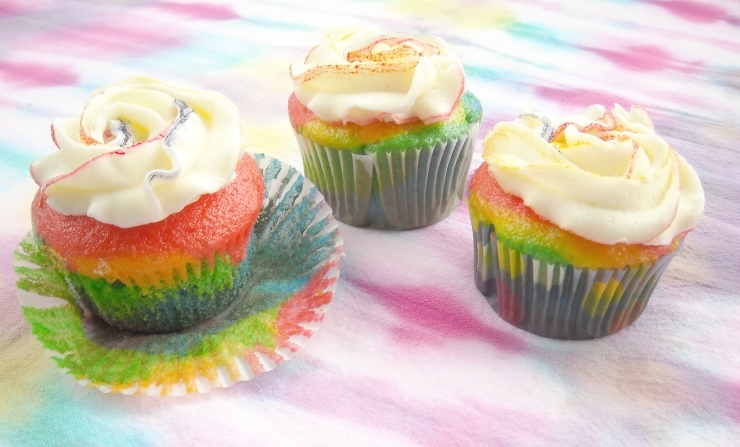 Your cupcakes turned out so bright and perfectly colored! i'm a french student, fan of cupcakes and american food. 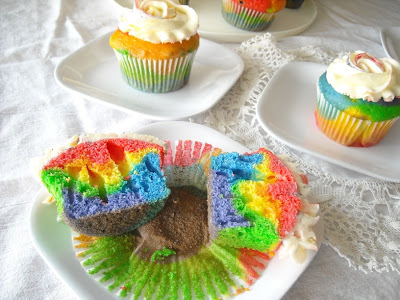 I don't have try rainbow cupcakes yet. I’ve seen couple of similar cupcakes on web but this is on of the best ! 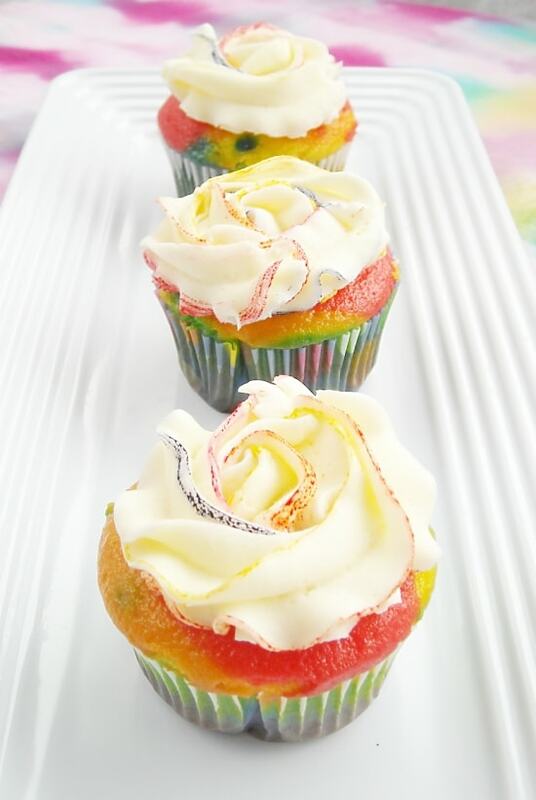 I would really like to showcase them on my cupcake recipes and ideas blog if you agree! 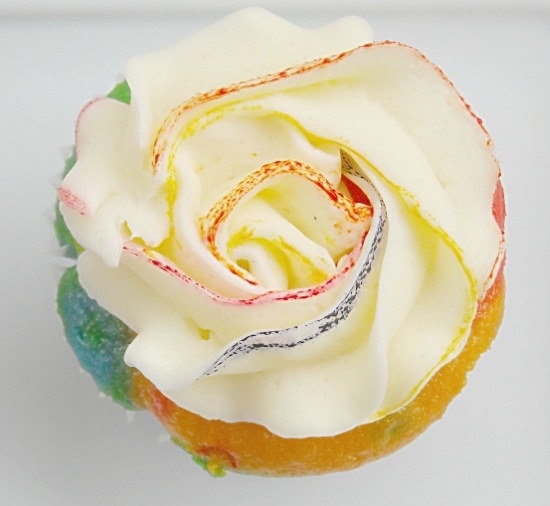 Thank you and yes you can feature my rainbow cupcakes on your beautiful cupcake site. Let me know when you feature them. I was curious about the frosted top decoration. Did you do a classic rose then lightly dust the color on the edges or did you use a different technique? Thank you so much for sharing your delectable work of art with us!! Thank you very much! What I did was load the tip of a long skewer with some Wilton color paste and run it along the seams of a plastic pastry bag. Then I filled it with white frosting. I did use a rose tip on the bag. These are absolutely gorgeous! I would like to *attempt to make these for my daughter’s upcoming bday. Could you explain again how you got the edges of the frosting? Did you dip the skewer in multiple colors? This is such a lovely technique. You are so talented. Candance I used 4 long skewers. One for each color. Then starting at a seam in the decorator bag I put the skewer in at the seam, down to the tip of the bag and pulled the skewer up making sure the gel food coloring rubbed off on the inside of the bag. I did the same thing four times on one bag. Then I carefully added the frosting to the bag. Trying not to move the gel coloring. I hoped that helped. One of these days I will have to make a short video. These rainbow cupcakes look so pretty and perfect to make for my 2 granddaughter’s next birthday parties. Thanks so much fr sharing! You are welcome. Your granddaughter will love them! I love these! I just bought box mixes with the color already in them just a week ago. I’m too lazy to mix all the colors myself. 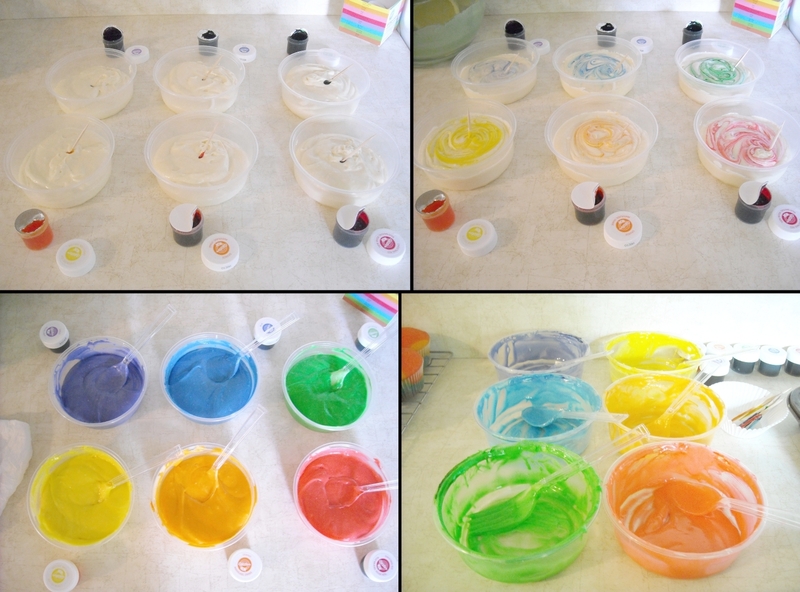 The new colored box mixes do make it so much easier to make any rainbow dessert. They weren’t available when I made these cupcakes.